To take us over the Easter holidays we've a little bit of a theme lined up. What are the materials that make up our planet? It’s important when considering this to realise that most of the volume of material on the Earth is actually under our feet. The internal structure of the Earth, by Kelvinsong. 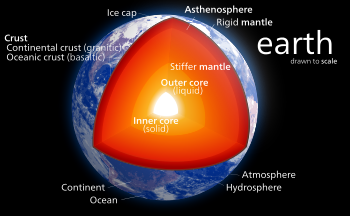 But let's start on the outside, looking at a group of minerals in the Earth's crust. We could write a whole week of posts about feldspar minerals, there are that many of them. When you consider them all together they make up a large proportion of the Earth's crust. They all have the same arrangement of silicate tetrahedra (the blue shapes with red oxygen atoms at the corners), but differ in the elements that are stuffed into the channels. 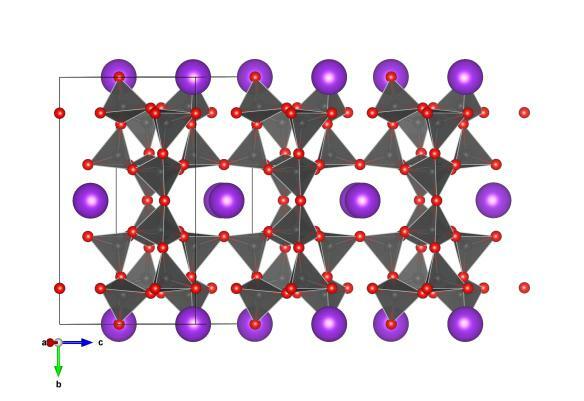 You usually can find some aluminium in there, but other elements found in feldspars are potassium (as shown by the purple atoms), sodium and calcium. The bigger elements, like calcium, can actually distort the silica, so that the whole structure of the material changes. This strain from different elements means that there are two main types of feldspars found on Earth, known as Orthoclase and Plagioclase. These can grow together in some cases to give a nice pearly lustre to the resultant material, which is known as moonstone. As explained, the dimensions of the feldspar crystal structures are highly dependent on the elements that are stuffed in the channels of the tetrahedra. Here's a great reference with lots of crystal structure examples of the more symmetric monoclinic feldspars.